We Be Reading: Five Years of We Be Reading! Five Years of We Be Reading! Thank you, Lenore, for being my earliest commenter that is still blogging! She commented on August 12, 2008 and I truly appreciated it then and now. Thank you, Carl, for creating the absolute best challenges (Science Fiction Experience, Once Upon a Time and Readers Imbibing Peril) and read-alongs in the book blogosphere. These events tend to pop up right when I need a blogging or reading pick-me-up. I've enjoyed every single one (maybe a little too much sometimes). 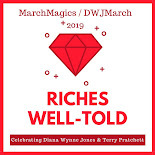 Thank you, Jenny, for being the inspiration for the best event that I have ever hosted -- Diana Wynne Jones March. It wouldn't have been created if it wasn't for you. Thank you, Elizabeth and Tif, for reading along with me more than once. It's made the journey so much more fun! Thank you, Andi and Heather, for creating The Estella Society. It's a fantastic place for community building and I would love to see more of you others contributing over there (not so subtle nudge)! Even though I've been posting erratically here on my own blog lately, I've been having lots of fun keeping up with the Top 100 Chapter Books Project over there. Thank you to Natasha, Ana, Trish, Danielle, Aarti, Anastasia, Karen, Simon, Iris, Simon, Jenny and Teresa, Danielle, Tasha, and so many others for writing the blogs that I love to read. And finally, thank you, dear readers, for reading and commenting and recommending and everything else you've done to support our blog! So here's to more bright blogging days ahead. I can't guarantee five more years but I hope that the blog's natural course lasts for a while longer. And thank you! Wow, five years already? Amazing how time flies when you're having fun. Here's to many, many more! Aww, thank you so much for the shout out, Kristen. Happy, happy bloggiversary, and here's to many more years! Aw, Kristen, how nice you are. I'm happy to have been the inspiration of an event I super love. I know you cannot promise to keep blogging forever, but I add my hopes to yours that the blog will not have run its natural course for a while yet. You remain one of my favorite bloggers! congratulations, that's a big one! And many more! Congrats Kristen -- I never thought I'd make 5 years either, time is a scary thing. Hope you continue to keep blogging. Congratulations, Kristen. I hope you are able to keep blogging for some more time. It comes and goes in waves for me, though I always come back to it and the book community.